Having celebrated with thanks the recent Fourth of July holiday, I confronted what has become an annual ritual, the sifting through of my Facebook feed’s many conflicting statuses about the day. They range from the thankful, to the incensed, to the proudly patriotic, to the hurt or doubtful. There are many who take issue with this celebration of our nation and her history and promise. Yet, I often find myself reading with a certain discomfort both those that seem too chest-thumpingly proud and those that seem too knee-jerkingly critical. I am often asked, as a priest, to account for the many failures of the Church and her people. How can I belong to – not only belong to but preach on behalf of – a Church that fails her people in so many ways. I think the indictment would be too long for any one column and yet here I am, becollared and beholden as part of this Body which too often reveals the flaws of human nature rather than showing more deeply the self-giving love of Christ. Yet, I serve not the Church alone but that deeper reality which is at her heart, the risen Christ whose love is revealed in glimpses and by degrees in the life and labor of his Church. 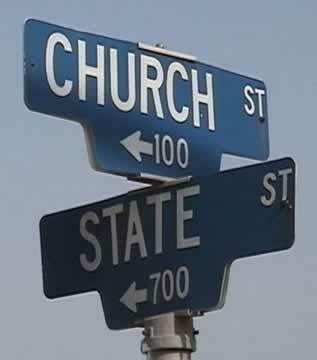 Like a nation, many of us have not chosen the Church, we have been born into it. We are heirs to the promises offered and receive them without earning or even necessarily being aware of them at a deep and abiding level. There are those who sacrifice to make their promises manifest – soldiers offered in wars to make men free (or at least told that is their mission) and saints dying as the praises of God live on after they are taken into glory. Both as a citizen of this Republic and the Kingdom to come I commit myself to the promise of both. This necessarily means knowing where our faults are so that we can continue to grow into the ideal that each offers to us and our fellow-citizens. The promises of each can seem beyond our reach and yet we struggle with all the freedom and power given us as citizens of the City of God. Those of us who live as members of the Body are called with our whole self to reflect back to our nation where it is failing to live up to its own promises to its own people and to the world around it. We are the conscience of the whole of society and yet we get it wrong too and are just as accountable to those we serve (the whole of the people of God). So we hold a tender balance in our hands and hearts. How do we maintain the delicate balance between being held accountable and holding our sisters and brothers accountable as well? The chief value of the Church is self-offering while the chief value of the state (and especially of Empire) is security (more precisely the maintenance of structures which mimic security). Yet the Church must always be on the cusp of collapse to be the truly leading edge of the culture. We must not share the same addiction to security that afflicts our national polity if we are to truly live as heirs of Christ. Every martyr, saint, and prophet attests to the Church’s only great promise – that we are found in losing all that we think makes us secure. Look at the many ways in which society promises security – it goes far beyond the military-security complex. We buy insurance to protect our property and inheritance. We buy security systems, health plans, fences, botox, and more so we can hold on a little more tightly to that which always seems to be slipping away. In all of this we maintain the fiction of control because the alternative, lack of control, is unthinkable and terrifying. Yet the Church can never sell control, security, or the thinkable – we only have the unthinkable to offer with any great confidence. That unthinkable is a God with Us, is secure in a Cross, and is overflowing from an empty tomb. So we offer not security but the ultimate and greatest insecurity – that God is calling his Church forward, over the edge, and into great mystery. If he were calling us to security alone then the State would be our great hope – yet we are its. We are the great hope of the nation and the world for we are calling them to a way of being that rests in the promise that the giving of self is known in the outpouring of the cross. There lies our model for how to live as citizens of both a Church and state that too often fail to live up to their promise and potential. The quest for security has been the occasion for sin across time, place, and circumstance and is the chief temptation of our days – that we can manipulate events and people to hold on tighter and tighter to a world that is ever spinning, turning, and falling away from our grasp. Yet, we can, as Christians celebrate our citizenship in this nation. We can celebrate that we live in a nation that has, at the heart of its national identity, notions of freedom and justice. God can do much with those impulses and is calling his people to model what it means to truly live into them. Just as the Church will often fail her people, so will the nation, and yet we know there are promises made that we are being called to keep. In Church, we often call God King, or Father, or Lord – we do this not as a way of saying that we expect God to live up to human notions of what it means to be any of them – but that God is the fullness and fulfillment of all of them. We know kingdoms will fall even as the Kingdom endures. We know that fathers will too often abuse or abandon their role, yet we have been welcomed to call God Father by Christ as brothers and sisters. We use these terms because they give us some insight into the nature of God even as we know God cannot be described or circumscribed by those human ascriptions. Being citizens of the Kingdom means that we know the fullness of any definition that we use for God – each of them is swelled to the fullness of their potential meaning in God. Citizens of the Kingdom are called to know the fullness of the promises of God and to make them known. When we live as citizens of this state we are called to reveal, to work for, to proclaim the nature of justice, the fullness of equality, the essence of freedom. These terms have their essential promise in the nature of God’s call to his people – in how we care for and sustain one another. So we live knowing that we fall short of their fullness and yet we can celebrate that these notions are at the core of our national identity as we strive to make them realized, lived, and embodied. The terms do not describe things as they are – they describe things as they might be – they are promises and potential and that we can celebrate even as we get back to the hard, hard work of making them known.